Designed for outdoor fixtures, this medium-sized 36-LED floodlight only needs 4 watts of power to put out the 300 lumens! The wide output angle is excellent for illuminating dark areas with motion-activated security fixtures, but it also works great indoors too! Pros: Reasonable price, even for 300 lumens. Cons: Only outputs 300 lumens: about what a 40W incadescent produces. Other Thoughts: The product description is inaccurate at best, deceptive at worst. If I'd been expecting 300 lumens I wouldn't have been disappointed, but a 65-watt incandescent bulb puts out 850+ lumens, so I'm not satisfied. Please contact our customer service department to arrange for a refund. 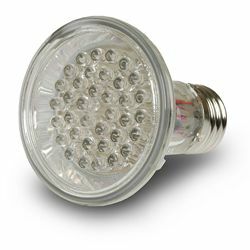 We have since modified the specifications shown to include the lumen count and to deemphasize the manufacturer's statement that the bulb is a 65-watt equivalent. We apologize for any misunderstanding. 14 out of 14 find this review helpful.